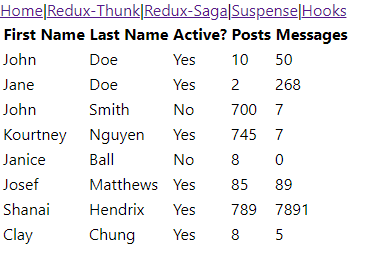 In this article I’ll compare different approaches to load data in React using Redux-Thunk, Redux-Saga, Suspense, and Hooks. In this article I’m trying to compare different approaches to solving this problem. Let’s define the problem first. This article is going to show 4 ways of solving this problem and compare pros and cons of each one. It isn’t detailed a manual how to use thunk, saga, suspense or hooks. For testing purposes we are going to use json-server. It’s an amazing project that allows us to build fake REST APIs very quickly. For our example it looks like this. After starting the server, a call to the http://localhost:4000/users returns the list of the users with a delay of about 2s. Now we are ready to start coding. I assume that you already have a React project created using create-react-app with Redux configured and ready to use. If you have any difficulties with it you can check out this and this. Redux-thunk is a recommended middleware for basic Redux side effects logic such as simple async logic like request to the API. Redux-thunk itself doesn’t do a lot. It’s just 14 Llnes of the code! It just adds some “syntax sugar” and nothing more. Flowchart below helps us to understand what we are going to do. Every time an action is performed the reducer changes state accordingly. 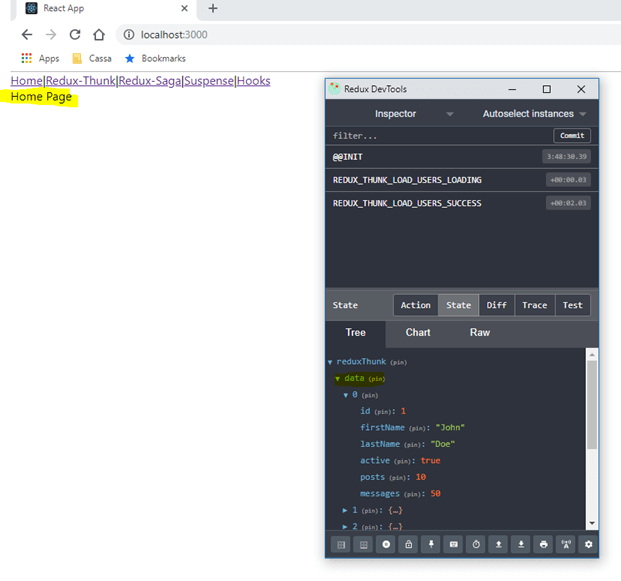 Component maps state to properties and uses these properties in revder() method to figure out what the user should see: loading indicator, data or error message. To make it work we need to do 5 things. In line 12-13 we also configure reduxdevtools. A bit later it will help to show one of the problems with this solution. It’s also recommended to have action creators separated (it adds some additional codding), but for this simple case I think it’s acceptable to create actions “on the fly”. “Recommended” approach for react/redux applications. No need to learn new things. Redux-saga is a redux middleware library designed to make handling side effects in an easy and readable way. It leverages an ES6 Generator which allows us to write asynchronous code that looks synchronous. Also, this solution is easy to test. From a high level perspective this solution works the same as thunk. The flowchart from thunk example is still applicable. To make it work we need to do 6 things. Saga has quite a steep learning curve, so if you’ve never used it and never read anything about this framework it could be difficult to understand what’s going on here. Briefly, in userSaga function we configure saga to listen to LOAD_USERS_LOADING action and trigger fetchUsersfunction. fetchUsersfunction calls API. 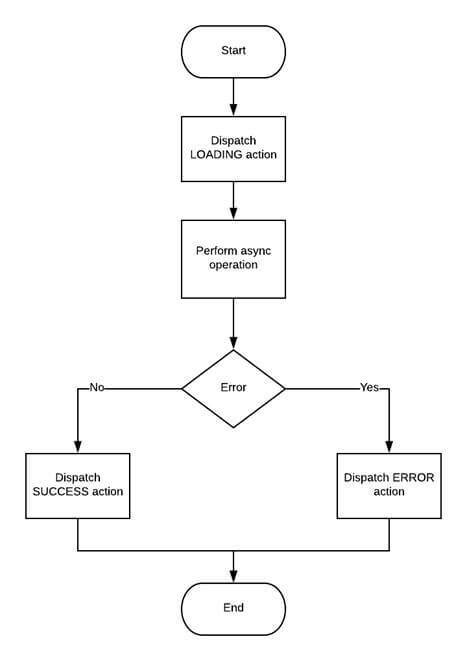 If call is successful, then LOAD_USER_SUCCESS action is dispatched, otherwise LOAD_USER_ERROR action is dispatched. Reducer is absolutely the same as in the thunk example. Component is also almost the same as in the thunk example. Suspense is a new feature in React 16.6.0. It allows us to defer to the rendering part of component until some condition is met (for example data from API loaded). To make it work we need to do 4 things (it’s definitely getting better :) ). For cache we are going to use simple-cache-provider which is a basic cache provider for react applications. For this example, we need to create an additional component which loads and shows data. Here we are creating resources to get data from API. Some new concepts need to be learned (which is part of the React). By the time of writing this article hooks are not officially released yet and available only in the “next” version. Hooks are indisputably one of the most revolutionary upcoming features which can change a lot in the React world in the near future. More details about hooks are here and here. Here we are creating 3 hooks (functions) to “hook into” React state. At first glance, the code looks weird and difficult to read and understand. It will take some time to get used to hooks.